Thermoplastic PVC roofing is extremely strong, as its heat-welded seams form a permanent, watertight bond that is stronger than the membrane itself. 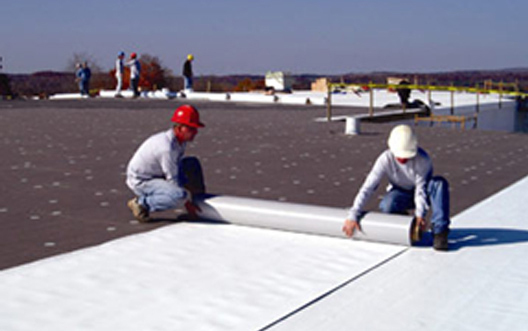 PVC resin is modified with plasticizers and UV stabilizers, and reinforced with fiberglass non-woven mats or polyester woven scrims, for use as a flexible roofing membrane. PVC is, however, subject to plasticizer migration. (a process by which the plasticizers migrate out of the sheet causing it to become brittle.) Thus a thicker membrane has a larger reservoir of plasticizer to maintain flexibility over its lifespan. Vinyl roofs are inherently fire resistant due to their chemical composition and have a broader range of fire ratings over common substrates.